Thinking Through Scripture | "but the word of the Lord remains forever"
52 Reflections on the Gospel of John: #29. Conversing with Nicodemus (Part 2). Normal people aren’t friends with snakes. Snakes and humans are natural enemies. Snakes are creepy and often dangerous and always make a good companion for a villain. They certainly aren’t the hero of the story. That’s why Numbers 21 and John 3 work together in a fantastically ironic and beautiful way. Jesus draws an incredible parallel between a snake and the crucifixion (John 3:14-15). If you remember Numbers 21, the children of Israel begin to complain against God…..again. This is a constant problem after the Exodus. They long to go back to Egypt. Back to slavery where they were miserable, cried and wept for deliverance, hopelessly labored without end, and had their children murdered and thrown into the Nile. You know, the good ol’ days. Well, during this complaint a plague of venomous serpents swarmed the camp and people started dying. They cried out to God, who heard them, and prepared a means of salvation. Moses was to fashion a serpent made of bronze, put it high on a pole, and all who were bitten could look up to the bronze serpent and miraculously be saved. God did not, by the way, rescue them by removing the snakes. That would have been by preference. Instead, he allowed them coexist with the snakes, but gave them a means of deliverance through it. The serpent on a pole has long been a symbol of healing power, from Moses to Asclepius to Hermes even to the modern field of medicine. But Jesus sees this symbol from Numbers 21 as the prefiguration of a different kind of healing. Just like that rod with the bronze serpent was lifted up, so will the Son of Man be lifted up. Ironically, serpents were the cause of death in Numbers 21 but a serpent lifted high was the means of salvation. In our lives, death is the problem we all face but a death lifted high is the means of salvation. The death of Jesus. And it is that death to which we all must look. A beautiful life-giving death. Just like those venomous snakes still existed to bite and spread death in Numbers 21, so sin and its lethal bite still exist in our world. But a means of salvation exists right alongside. This sacrificial means of salvation is the clearest image of the love of God that can be seen: “For God so loved the world, that He gave his only begotten Son, that whoever believes in Him will not perish, but will have eternal life” (John 3:16). Before the bronze serpent was made, the people were already bitten and dying. The bronze serpent had one purpose, to bring about salvation. Condemnation was already part of the story. So it is with the coming of Jesus. The world condemned itself on its own without Jesus’ help. He came not to condemn, but to provide a way out of it (John 3:17-18). To be a source of salvation out of the sin and death of the world. A focal point of deliverance and the love of God. Now the conversation with Nicodemus immediately shifts again to a major talking point in the Gospel of John: light and darkness. In John, “night”, “darkness”, and “blindness”, are all representative of a spiritual condition without Christ. Jesus came as a Light to shine in the darkness (John 1:4-5, 9). He twice describes Himself as the “Light of the World” (John 8:12; 9:5). The first time is a call to leave darkness and to have “the Light of Life.” The second is a description of his role in the world right before He heals a blind man. 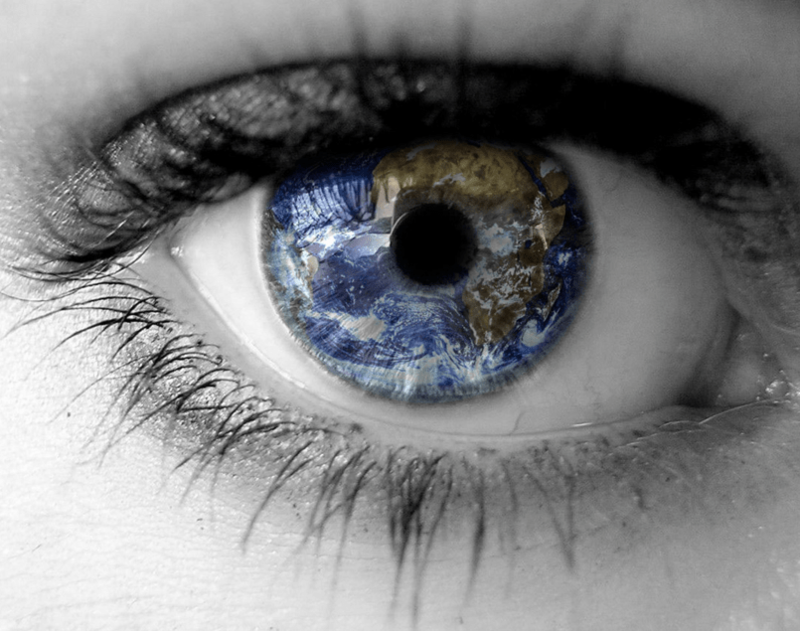 Giving sight to the blind, one who sees only darkness, is done by the Light of the World. Those who are in darkness need this light. Those who are blind need this light. And by the way, Nicodemus, those who come to Jesus “at night” need this light. Remember when Judas left to go betray Jesus? Guess what time it was? “So after receiving the morsel he went out immediately; and it was night” (John 13:30). Judas needed this Light. In Genesis 1, light is the first thing God sends to the world of chaotic water and darkness. In John 1, Light is what God sends to the chaotic world of sin and darkness. Jesus came as a Light to enlighten the world, not to condemn it. But tragically the world preferred darkness. Imagine in Genesis 1, the world rejecting God’s act of creation. In John we see the world is actively rejecting God’s act of New Creation. But there are some that don’t. Some actually are born from above. Some see the kingdom as it truly is. Some come out of darkness into His marvelous Light. Some, Mr. Nicodemus, find eternal life. This conversation has a lot of twists and turns, but I think the key to it all is in the first words Jesus says to Nicodemus: “Unless one is born from above, he cannot see the kingdom of God” (John 3:3). Jesus is bringing a kingdom. This kingdom is “not of this world” (John 18:36). It’s easy enough to see a worldly kingdom. The Roman Empire was so visible no one could miss it. But Jesus’ kingdom can be missed if you don’t look carefully. Remember when Jesus is arrested, beaten, and paraded before the Jews with a purple robe and a crown of thorns on His head? He stood there, alone, bloodied in weakness and anguish while Pilate said, “Behold, your King!” That’s a kingdom moment. Most people who look, they don’t see the sacrificial love of God, they don’t see the Light of the world, they certainly don’t see a king. They see weakness and failure and a fool getting what He deserves. They see a false Messiah. A failed rebellion. A criminal who lost to the mighty Roman Empire. The kingdom of God is appearing right in front of them, and they walk by waging their heads. But those who have been born from above have eyes that see. They see the kingdom and they behold their King. I wish I knew more, but the story of Nicodemus ends with a “perhaps.” Perhaps Nicodemus and Joseph of Arimathea give Jesus the burial worthy of a king (John 19:38-42) because their eyes have been opened. Perhaps birth from above is causing them to see things that they previously missed. Perhaps an entirely new life awaits them. Perhaps the same could be said of you. Perhaps. It is not unimportant that Nicodemus comes to Jesus “by night.” Little details like that are rarely insignificant. They are intentional and need to be noticed. They shape the whole story. When Nicodemus is mentioned again after the crucifixion, he is described as “Nicodemus, who had first come to Him by night” (John 19:39). That passage links him to Joseph of Arimathea, who is described as “a secret disciple.” Joseph was like Nicodemus in many ways; a wealthy, powerful man who was also a member of the Sanhedrin and opposed the decision to crucify Jesus (Luke 24:50-51). But he was also unwilling to publicly put his faith in Jesus. Nicodemus put his faith in Jesus, but only at night. Joseph put his faith in Jesus, but only in secret. Following the crucifixion, however, they find themselves together, coming forward to honor Jesus as a king, regardless of what the public thinks. They weren’t alone in their secrecy by the way. John 12:42, 43 explains, “Nevertheless many even of the rulers believed in Him, but because of the Pharisees they were not confessing Him, for fear that they would be put out of the synagogue; for they loved the approval of men rather than the approval of God.” Their silence is explained by two things: what they feared and what they loved. They feared reprimand. They feared expulsion from the synagogue, which would include loss of status, respect, and community. This is the same thing that the blind man’s parents feared (John 9:23). This is the same thing that many in the early church feared, and they clung to passages like this to remind them, not to be motivated by fear, but love. Not love for the approval of men; that love makes you a slave. That love works hand in hand with fear. That love keeps you silent about Jesus. But love for the approval of God, which no hatred, persecution, or fear could ever take from you. Perhaps the cross was exactly what Nicodemus and Joseph needed to move beyond fear, and begin to show their love of Christ openly. One of the famous misunderstandings in the Gospel of John centers on the phrase γεννηθῇ ἄνωθεν, “be born again.” The multiple meanings of the word ἄνωθεν become the main source of confusion. The word could mean “again” and that’s certainly how Nicodemus hears it. But the word could also mean “from above” or “from heaven” which I think is how Jesus actually means it. In John 3:31, Jesus says, “He who comes from above is above all…He who comes from heaven is above all” Guess what that phrase “from above” is in Greek? ἄνωθεν. It’s the exact same word. There is a major theme in John about ascending and descending, up and down, above and below. Jesus comes from above, from heaven, so He brings a heavenly perspective to all his teaching. But those who come from below fail to grasp it. “If I told you earthly things and you do not believe, how will you believe if I tell you heavenly things? No one has ascended into heaven, but He who descended from heaven; the Son of Man” (John 3:12-13). There is a difference between earthly things and heavenly things spoken by Jesus. The misunderstandings in John always occur when people hear the earthly thing instead of the heavenly. That’s why Nicodemus doesn’t hear the heavenly message about being born of God from above, he hears the earthly message about crawling back into his mother’s womb. But to be born from above is the same thing as being born “not of blood nor of the will of the flesh nor of the will of man, but of God” (John 1:13). God is above, God is Spirit (John 4:24), the one who is born from above, and is born of water and Spirit, is born of God. That one who is born from above is also born of God, born of Spirit, and born of water is really interesting. We may think that water doesn’t seem to fit well with these other descriptions, water is not God, Spirit, or from above. But water does take on a significant spiritual role in the Gospel of John. Immediately following this conversation with Nicodemus water is linked with baptism (John 3:22-23). The phrase “because there was much water there” (John 3:23) seems like a peculiar detail to add, which means it probably shouldn’t be glossed over. I don’t see any way the early church doesn’t see baptism when they read John 3:5. But water is also connected to eternal life (John 4:10-14), sight for the blind (John 9:7), washing that gives you a part with Jesus (John 13:8), and the blood of Jesus (John 19:34). But most significantly for our passage, it is linked directly to the Holy Spirit, “Jesus stood and cried out, saying, ‘If anyone is thirsty, let him come to Me and drink. He who believes in Me, as the Scripture said, “From his innermost being will flow rivers of living water.”’ But this He spoke of the Spirit, whom those who believed in Him were to receive; for the Spirit was not yet given, because Jesus was not yet glorified” (John 7:37-39). Jesus then uses another word that has a double meaning: πνεῦμα. This word means “wind” or “Spirit” and Jesus uses it to mean both in the very same verse! “The wind blows where it wishes and you hear the sound of it, but do not know where it comes from and where it is going; so is everyone who is born of the Spirit” (John 3:8). Imagine Jesus and Nicodemus talking, late into the evening, on a gusty night. They can hear the wind but cannot predict where has come from or where it will end up, nor can they control it. Nicodemus is a man used to authority: making decisions, having control, running his own life. Jesus is telling Him, to be born of the Spirit is to give up control. You have as much control over the Spirit as you do the wind. By the way, we should always be a little cautious when some teacher or preacher tries to tell us exactly what the Spirit can and cannot do or will and will not do. There is a lot of ambiguity to the work of the Spirit in the Bible. And I believe that’s intentional. To nail down the Spirit is like nailing down the wind (I mean, it’s the exact same word!). Good luck! It is better to watch and see what happens, than to try to control and confine. A prominent older man, a respected leader in society, a high-ranking religious ruler of the people stands alone out in the shadows late one night, waiting for a clandestine meeting with a young, controversial, and rebellious new teacher who just came to town. He intends to covertly pass on a dangerous but important bit of information. Nicodemus: “Rebirth? What, (“chortles”) you expect him to crawl back into his mother’s womb and start life over? Jesus: “You’re a Pharisee and member of the Sanhedrin. I thought you were supposed to be the great teacher of Israel? But you don’t understand? Listen closely, this is the truth you need to hear, people know and talk about the things they have seen. Fleshly people talk about fleshly things because that’s all they’ve seen and it’s all they can understand. But I have descended from heaven. I have seen God’s powerful reign at its fullest. I am the ultimate authority on the things of God. I am the very presence of God. When I speak of heavenly things, fleshly people just don’t get it. That’s why you need to be born again, born of God and His Spirit, born anew from heaven itself. Otherwise you’ll never understand. “No one who is fleshly has gone up to heaven, but I have. I’ve come down out of heaven. I am the Son of Man, the One who comes riding on the clouds of heaven. And just like when Moses lifted up that bronze serpent back in the wilderness, so I will be lifted up. And just like those who looked to that serpent were saved from venomous serpents, so anyone who looks to My death will be saved from death. The one who believes in me, will be saved from the condemnation of this world and enjoy eternal life. Life as it was always intended to be. This is how God’s love for the whole world is seen! That He sent His only Son that anyone who believes in Him, can have life eternal with God Himself. “Are you a born again Christian?” I’ve been asked this before. It’s an interesting question. The phrase “born again” has taken a life of its own in modern evangelical Christianity. When thinking of a person who needs a completely new life, to restart everything, to hit the reset button, it may be tempting to think about those we reach through prison ministry, or in drug rehabilitation. Those whose lives are spiraling out of control, recklessly destroying all of their potential and hope and future. They need a rebirth. But that’s not who Jesus tells to be born again. It’s not the drug addict who has lost control of his life, it’s not the inmate who longs for redemption, it’s not even the Samaritan woman who has had 5 husbands that Jesus meets in the next chapter; it’s the wealthy, respected, important, teacher of Israel. It’s the man who has all things in order. His life is the envy of others. He has success and prominence. He has done pretty well since his birth. This is not the person most would think needs a new birth. But Jesus does. Jesus sees through the success, the power, and the wealth, to a man just like any other. A man in need. The story of Nicodemus doesn’t go as far as I’d like it to. I’d love to see how it ends. But it does go farther than this conversation. This late-night conversation plants a seed which develops a little further in John 7 where Nicodemus defends Jesus, telling the other members of the council to at least meet with Him and talk to Him before you condemn Him. His objection is dismissed, but the seed is still germinating. Following the crucifixion of Jesus, another disciples, a secret one, named Joseph, takes the body of Jesus down from the cross to give it a proper burial. This is where Nicodemus shows up, with 100 pounds of myrrh and aloes to prepare and honor the body of Jesus. 100 pounds! That is a burial for a king. Not some crucified rebel. Not some failed Messiah. But a king. Perhaps, Nicodemus is beginning to see. Perhaps as day breaks on that world-changing Sunday morning, Nicodemus will no longer need to meet Jesus in darkness, but will walk in the light of life. So, if you’ve been reading these reflections up to this point, it may be starting to sound like a broken record, but when reading the Gospel of John you must look for meanings beneath the surface. There are things that physically literally happen, but there are also hints and clues towards deeper layers of meaning which the reader is supposed to pursue. Jesus literally got on His hands and knees, literally took water and a towel, and literally washed 24 feet. This took time and effort. It was done with care. It was an act of service that He wanted His disciples to experience and imitate. I’ve seen a preacher scrub vomit out of the church carpet where a little girl got sick. I’ve seen Christians open up their home on Thanksgiving to the homeless for a warm family meal. I’ve seen disciples giving rides to the elderly, repainting widow’s houses, raking leaves, changing light bulbs, fixing appliances, repairing cars, holding hands, praying, and literally washing those who could not wash themselves. I’ve seen the message of foot-washing lived out in the daily life of the church. While it’s possible to emphasize the failings and misconduct of the church, it’s essential to remember the good. The kind. The servants. The foot-washers (1 Timothy 5:10). That message and challenge must be seen in John 13. It must be lived out. But at the same time, is it possible that there is more going on here also? Is it possible that there is more than just a message of service? More than a literal foot washing? Perhaps a message about a different kind of washing that Jesus provides? “He came to Simon Peter, who said to him, ‘Lord, do you wash my feet?’ Jesus answered him, ‘What I am doing you do not understand now, but afterward you will understand.’ Peter said to him, ‘You shall never wash my feet.’ Jesus answered him, ‘If I do not wash you, you have no share with me.’ Simon Peter said to him, ‘Lord, not my feet only but also my hands and my head!’ Jesus said to him, ‘The one who has bathed does not need to wash, except for his feet, but is completely clean. And you are clean, but not every one of you.’ For he knew who was to betray him; that was why he said, ‘Not all of you are clean’” (John 13:6-11). There are a few clues alerting the careful reader that something deeper is happening here. Notice first, when Jesus says, “What I am doing you do not understand now, but afterward you will understand.” What does this mean? There is something missed in the moment, that will be recognized when looking backwards. You know the expression, “Hindsight is always 20/20”? Sometimes removing yourself by time from an event can help you see the event much more clearly. After the cross perhaps the disciples will look back on the foot-washing and see it in a whole new way. John sometimes lets the reader know about events that were not fully understood until some later point in time. Remember Jesus cleansing the temple? In this action Jesus profoundly links His body to the temple, but it’s a connection that no one seems to understand. Even the disciples. However John, the narrator, lets the reader know, “when He was raised from the dead, His disciples remembered that He said this; and they believed the Scripture and the word which Jesus had spoken” (John 2:22). Only by looking backwards were they able to understand and believe. So when Jesus tells Peter “afterwards you will understand”, the reader should begin looking for something that might be missed during the foot-washing, but that will come to light later. Do you believe that? Literally? If you wash only your feet, will you be completely clean? Try that for a few weeks and see how the rest of you smells. Physically, literally, it won’t work. The tone is changing here from literal water and washing, to something else. Some sort of washing that makes you completely clean and gives you a part with Jesus. Hearing this, and thinking physically (as is common in John) Peter misunderstands and demands more than the washing Jesus provides, but is told that what Jesus does is sufficient to make you completely clean. Just sit back and let Jesus lead. Let Him administer the washing. See what He does. At the end, rest assured, you will be completely clean. Not All of You are Clean? Notice third, the phrase, “but not all of you [are clean].” This is about Judas (verse 11). 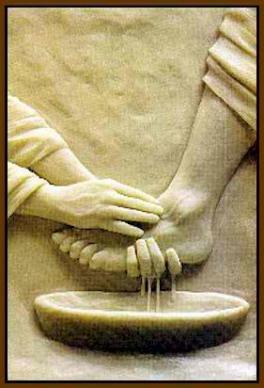 This is the dead giveaway that we are no longer talking about literal foot-washing. Jesus didn’t skip Judas’ feet, or do a sloppy job, or use dirty water. Judas’ feet were as clean as everyone else’s. But His heart wasn’t. Jesus masterfully transforms the conversation into a discussion about cleansing of sin, of impurity, a washing that gives you a share with Him. 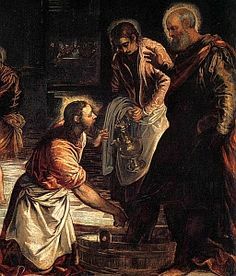 Judas received a washing, but walked away without ever really being clean. Water is almost always used symbolically in the Gospel of John (see Reflection #19). It is seemingly linked with baptism (John 3:5, 22-23), eternal life (John 4:14), the Holy Spirit (John 3:5, 7:37-39), sight (John 9:7), and the blood of Jesus (John 19:34). I think the foot-washing is no different. The text hints towards a deeper and symbolic washing provided by Jesus; a washing that makes one completely clean and gives you a share with Jesus. Perhaps while reading this, it’s appropriate not only to ask ourselves questions about humility and service to others, but also about baptism, the Holy Spirit, forgiveness, and eternal life. Have you been washed by Jesus? The story of Jesus washing His disciple’s feet is a magnificent look into Jesus’ whole worldview. It is a tremendous picture of what His ministry was all about. It’s a glimpse of the humility and love that ultimate takes Him to the cross. It’s a call and challenge to each of His disciples to lay down pride, status, and social hierarchies and submissively and humbly love. Love with kindness. Love with service. Love with action. “Love one another, even as I have love you” (John 13:34). But even more than that, it is a call to love and serve all. Even the sinful. The greedy. The unlovable. Those who have mistreated you. Or will mistreat you. Love even your enemies. Love and expect nothing in return. Serve without repayment. Be kind no matter what. That’s what the cross is all about: Giving up everything for sinful humanity. Most of whom will not really care. Most of whom will not return that sacrificial love. 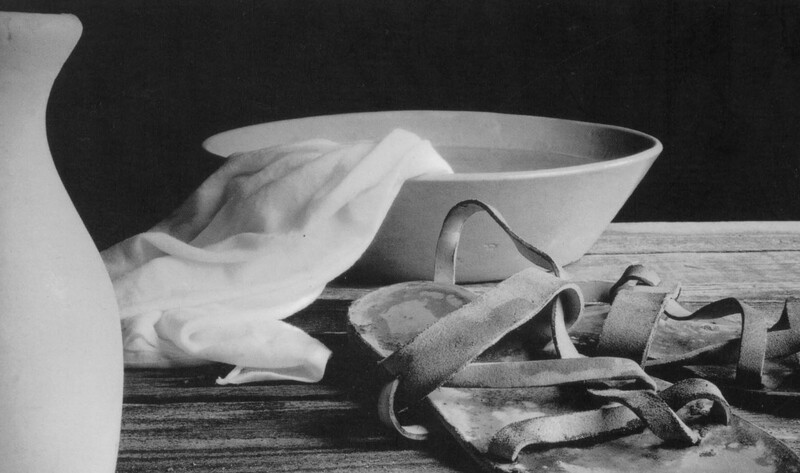 Foot-washing and the cross closely mirror each other. “I say to you who hear, Love your enemies, do good to those who hate you, bless those who curse you, pray for those who abuse you. To one who strikes you on the cheek, offer the other also, and from one who takes away your cloak do not withhold your tunic either. Give to everyone who begs from you, and from one who takes away your goods do not demand them back. And as you wish that others would do to you, do so to them. If you love those who love you, what benefit is that to you? For even sinners love those who love them. And if you do good to those who do good to you, what benefit is that to you? For even sinners do the same. And if you lend to those from whom you expect to receive, what credit is that to you? Even sinners lend to sinners, to get back the same amount. But love your enemies, and do good, and lend, expecting nothing in return, and your reward will be great, and you will be sons of the Most High, for he is kind to the ungrateful and the evil. Be merciful, even as your Father is merciful” (Luke 6:27-36). Judas was there. Judas had his feet washed just like everybody else. He wasn’t skipped. He wasn’t rejected. Even though he would not respond with kindness. It would not soften his heart. He wouldn’t change his ways. Jesus still loved and served him. Because that’s what Jesus does. That who Jesus is. And that’s our challenge to imitate. The more I read the John 13 the more I see that Judas’ feet are actually a focal point of the whole story. Notice how it begins: “During supper, the devil having already put into the heart of Judas Iscariot, the son of Simon to betray Him, Jesus…got up from supper, and laid aside His garments; and taking a towel, He girded Himself. Then He poured water into the basin, and began to wash the disciples’ feet” (John 13:2-5). The whole story begins by focusing everyone’s attention on the unclean heart of Judas. Now, notice how this story ends: “When Jesus had said this, He became troubled in spirit, and testified and said, ‘Truly, truly I say to you, that one of you will betray Me…After the morsel, Satan then entered into [Judas]…So after receiving the morsel he went out immediately; and it was night” (John 13:21-30). Immediately following the foot-washing, that’s when Judas leaves the meal to go betray Jesus. It is one of his very last interactions with Jesus. It’s sandwiched between Satan putting the sin into Judas’ heart, then Satan actually entering fully into him. But not only is Judas at the beginning and end of the story, he’s right in the middle of it. When Jesus is washing their feet, Peter shouts, “Never shall You wash my feet!” (John 13:8). Jesus’ response is remarkable: “‘If I do not wash you, you have no part with Me…He who has bathed needs only to wash his feet, but is completely clean; and you are clean, but not all of you.’ For He knew the one who was betraying Him; for this reason He said, ‘Not all of you’” (John 13:8-10). Right in the middle, Jesus makes a brief comment about Judas, then continues washing their feet. Judas is at the beginning, middle, and end of the foot-washing narrative. That probably means we should reflect on him as we read. Jesus’ kind act of service did nothing to stop Judas. It did not change his heart or mind. In fact, things escalated from there almost immediately. It’s wonderful to believe that kindness can change people. Because it can. It has and does. But not always. Judas’ feet were cleansed, but his heart wasn’t. Judas betrayed Jesus with clean feet and a filthy heart. Earlier in John, this reality is foreshadowed in another foot-washing scene. Mary washes Jesus’ feet with an expensive perfume, but Judas objects, saying that she should have sold the perfume to provide for the poor. Then John gives the reader a little insider information: “He said this not because he was concerned about the poor, but because he was a thief, and as he had the money box, he used to pilfer what was put into it” (John 12:3-6). These two foot-washing scenes fill in a lot of details about Judas, and none of them are good. While reading John 13 it’s important to notice the comparison taking place. On the one hand you have Judas. He has been following Jesus for years now. Has seen incredible things. Has seen the hungry fed, the blind given sight, the lame healed, and the poor blessed. He has seen the signs, but has rejected their significance. He may like Jesus, but he loves money more. And he serves himself above all. On the other hand you have Jesus, the polar opposite. He was humble, selfless, and generous. He freely took upon Himself the job of a slave. He cared more about His disciples’ feet than His own pride, or status, or self-importance. Money, power, or fame didn’t motivate Jesus. Self-giving love. That’s what Jesus was. That’s what Judas rejected. And that’s what we are all challenged to embody. 52 Reflections on the Gospel of John: #24. Let God Wash Your Feet. As we noted in Reflection #23, the Gospel of John teaches an Incarnation Christology, meaning that Jesus existed as God prior to becoming human flesh. The Logos was with God and was God and created all things with God. So anything you see Jesus doing is teaching you about God. One of the problems we sometimes run into is that we have concepts of who God is and we try to fit Jesus into those concepts. I think a better approach, is to forget everything you thought you knew about God. Then look at Jesus. Learn God from Jesus and fit everything else into that. “No one has seen God at any time; the only begotten God who is in the bosom of the Father, He has explained Him” (John 1:18). This passage is saying that we haven’t seen God, so if you want to get to know Him, if you want to see Him, look at Jesus. He has “explained”, or literally exegeted Him. This is why, when Philip tells Jesus, “Show us the Father, and it is enough.” Jesus responds by saying, “Have I been so long with you, and yet you have not come to know Me, Philip? He who has seen Me has seen the Father; how can you say, ‘Show us the Father’? Do you not believe that I am in the Father, and the Father is in Me…Believe Me that I am in the Father and the Father is in Me.” (John 14:8-11). Or, consider the unfathomable claim, “I and the Father are One” (John 10:30). If your view of God is inconsistent with the life and teachings of Jesus, then change your view of God. If you read passages that depict God differently than Jesus, then change the way you read those passages. A remarkable aspect of early Christianity is that Jesus entirely changed the way the church viewed God and the way they read the Old Testament. Paul says Christians can now read with “unveiled faces” (2 Corinthians 3:14-16). Luke says that Jesus opened His disciples’ minds to “understand the Scriptures” (Luke 24:44-45, 27). John, after Jesus cleansed the temple and quoted Psalm 69:9, says it wasn’t until after the resurrection that “His disciples remembered that He said this; and they believed the Scripture and the word which Jesus had spoken” (John 2:22). So when you see Jesus doing something, you’re learning about God. You’re watching God. When Jesus washes feet, you’re learning that God washes feet. In 1st century Palestine foot-washing had a very practical and beneficial purpose. In fact, it still does in many parts of the world. It’s both an ancient and modern blessing. All the way back in Genesis 18, Abraham had 3 visitors (one of whom is the Lord) and made sure they got rest, food, and foot-washings (Genesis 18:4-5). Walking on old dusty roads in worn-down sandals, unable to hop in a car, sit in a cushioned seat, or wear cotton socks and Sonoma shoes (that’s my brand! ), there was little more pleasurable or comforting than to arrive at your destination, have a young female servant come over, remove your sandals, take a bowl of clean water and a towel, and rub your feet clean. Why wash feet? Because it was a kindness of real practical value. What about today? It can still be a kindness of real and practical value. But it is also a very powerful symbol. A symbol that reinforces the mindset of servitude that we are to have towards one another. When the Pope washes feet at a juvenile detention center outside of Rome, it illustrates something important. In the same way that a sermon (hopefully) encourages you to take a message and go apply it, foot-washing can be a call to go out and find ways to serve. But when reading the passage, there are two very important reasons that stand out as to why Jesus did this. The whole passage begins by saying “Jesus knowing that His hour had come that He would depart out of this world to the Father, having loved His own who were in the world, He loved them to the end” (John 13:1). Jesus washed His disciples feet, quite simply, because He loved them. We know He loved “the beloved disciple.” But He also loved Thomas, and Andrew, and Philip. He loved Peter who this same chapter He predicts will deny Him (John 13:38). He loved Judas who, as we will observe in more depth in the next reflection, would get up immediately following the foot-washing and betray Him. Jesus loved them, every unworthy one of them, and served them. The second reason is stated right after the foot-washing, when Jesus is explaining Himself. “If I then, the Lord and the Teacher, washed your feet, you also ought to wash one another’s feet. For I gave you an example that you also should do as I did to you” (John 13:14-15). The disciples are going to have some important roles in the church. People will know them. They will have authority and respect. They need to remember what it is all about. Ministry is not, ever, about becoming famous, getting praise, or feeling important. It is about foot-washing. It is about kindness and service and following the example of Jesus. Putting all of this together, remember that seeing Jesus is how we see God. Jesus’ love led Him to humbly take on the role of a servant, usually a low ranking servant, usually a female servant, and benevolently wash the feet of His disciples. That’s the kind of God who loves us. That’s the kind of God we serve. As we imitate Jesus, and follow His example, we’re showing that God to the world. When Jesus started to wash Peter’s feet, Peter protested, “Never shall You wash My feet!” (John 13:8). Peter had a social hierarchical structure in mind. The Lord shall never be a servant to me! This may have been humility on Peter’s part. But it was misguided. So often we want to reject an offer of kindness. We feel uncomfortable. Unworthy. But that’s the wrong response. Accept people’s kindness, and then give it to others. Instead of rejecting or negating kindness, multiply it! Accept the love of God given to you, and give it to others also! Let God wash your feet, then go wash somebody else’s. Nobody likes a demotion. No player likes to lose their starting status. People don’t generally like to go backwards. To make less money. To get less than they deserve. To work hard for nothing. But sometimes people do. They may be underappreciated. They may work hard and be under-performing. Or maybe, they chose to do less, make less, or “be” less at some job, because their priorities are changing. I know of people who have willingly taken demotions, taken less pay, taken fewer responsibilities, and worked fewer hours so that they could do more of what they care about: Spend time with their family, travel, read, or just simply enjoy life more. They stop living to work, and begin working to live. Love motivated Jesus. A level and depth of love that the world has never seen before. After washing the disciple’s feet, Jesus says, “A new commandment I give to you, that you love one another: just as I have loved you, you also are to love one another. By this all people will know that you are my disciples, if you have love for one another” (John 13:34-35). This “new commandment” is to love just as Jesus loved. An active, sacrificial, service-oriented love. A love that can change the world. “Christology” is a theological term which describes a field of study focused on the origin, nature, and personhood of Jesus. Christology addresses topics like the Hypostatic Union (the nature of the union of Jesus’ humanity and divinity), Aryanism, Adoptionism, etc. In New Testament scholarship various books are described as having a “High Christology” if Jesus is pictured as divine and equal to God (like John), or as having a “Low Christology” if Jesus is pictured as merely human (Mark and Luke are often said to have a “low Christology.” Richard Hays’ books Echoes of Scripture in the Gospels and Reading Backwards: Figural Christology and the Fourfold Gospel Witness present an excellent case that all four Gospels picture Jesus as divine and the embodiment of the God of Israel). Adoptionism is a form of “Exaltation Christology” which advocates that Jesus was born simply as a man, but was “adopted” to become divine (usually at His baptism or resurrection). He was “Exalted” to divinity. This is the idea of promotion. Jesus was faithful to God and was promoted because of it. The Gospel of John does not teach an “Exaltation Christology.” John teaches quite the opposite, an “Incarnation Christology.” This is the idea that Jesus was already divine, “the Word was with God and was God” (John 1:1), but came to earth to become human. He became incarnate, enfleshed, “the Word became flesh and tabernacled among us” (John 1:14). This would be a demotion: A willing, self-sacrificial, demotion. Jesus’ life was about willful demotions for the sake of love. The incarnation itself is a complete act of self-giving love. The cross is the most vivid, heart-wrenching, and powerful picture of self-giving love that has ever been seen. But in-between those two events were 33 years of life. A life spent in selflessness, kindness, service, and sacrifice. Paul, while possibly quoting an early Christian hymn, writes about the incarnation, life, and death of Jesus in this way: “though he was in the form of God, did not count equality with God a thing to be grasped, but emptied himself, by taking the form of a servant, being born in the likeness of men. And being found in human form, he humbled himself by becoming obedient to the point of death, even death on a cross” (Philippians 2:5-8). As Jesus was preparing to depart from His disciples, as He was preparing for his impending execution on the Roman cross, He gave them a unique and beautiful display of a willful demotion. He got down on his hands and knees, took a rag, took upon Himself the job of a slave, and with their feet in His hands, began to wash. Jesus washed their feet. The Word who was with God and was God, washed their feet. God washed man’s feet. Dirty man. Sinful man. Man who would soon abandon Him. Man who would soon deny Him. Man who would soon betray Him. God loving took the dirty foot of Judas, a traitor and thief, a son of perdition, and scrubbed it clean. Jesus is God. Jesus is Lord and Teacher and Master. Yet He was not above becoming the slave who washed men’s feet. Just like the signs of Jesus are meant to teach important and valuable lessons, so is this. When He finished washing their feet, He asked, “Do you understand what I have done to you? You call me Teacher and Lord, and you are right, for so I am. If I then, your Lord and Teacher; have washed your feet, you also ought to wash one another’s feet. For I have given you an example, that you also should do just as I have done to you” (John 13:12-15). That concluding challenge of Jesus sounds a lot like what He says later in this chapter: “you love one another; just as I have loved you” (John 13:34). Love, serve, and wash one another, because Jesus loves, serves, and washes us. Jesus, as Lord and Teacher, was not above any task. Nothing was too demeaning. Nothing was too lowly or dirty for Him. So, what jobs are beneath you? What are you unwilling to do because, “that’s not my responsibility.” Are you willing to take a demotion? If you ever feel too proud, too educated, too wealthy, too important, too clean, too smart, too busy, to get on your hands and knees and wash a dirty foot, clean a dirty floor, or work on some lowly unglorifying task, perhaps we need to remember the love, service, and humility of Jesus. Remember the incarnation and the cross. Remember the dirty feet in-between. Tension often exists within our souls when a loved one dies. Particularly, when the deceased is a Christian. We know that better things await. We have hope. We have reason not to “grieve as the rest who have no hope” (1 Thessalonians 4:13). Paul writes, “For to me, to live is Christ and to die is gain…having the desire to depart and be with Christ, for that is very much better” (Philippians 1:21-23). Clearly, death produces something valuable and something better for the Christian. Through this hope, we can find some comfort in our misery. We know death isn’t the end, so we shouldn’t act like it is. But it doesn’t remove the misery and that’s where the tension lies. For us, and in Scripture, hope and misery walk hand in hand. It’s hard to be positive about death. Because we know that death is an attack on God-given life. Death is a terrible and dreadful enemy that seems to always win. The majority of Scripture does not paint death in any sort of positive light. God says, “I take no pleasure in the death of anyone who dies” (Ezekiel 18:32). Death only entered the world by sin, and when sin is eradicated through the death of Jesus, the necessary result is eternal life. Jesus’ death was a victory over sin. He took sin to the grave, so it’s no wonder He came back on the other side. Sin causes death, so when sin is destroyed, life wins! Every death is a reminder of this sinful, painful, fallen world. But we hope for something better. The death of sin and the victory of life walk hand in hand. Paul writes of death as an enemy doomed for destruction; “the last enemy that will be destroyed is death” (1 Corinthians 15:26). At the final resurrection, when our bodies are raised to eternal glory, then we can fully appreciate the saying, “Death is swallowed up in victory. O Death, where is your victory? O death, where is your sting?” (1 Corinthians 15:54-55). When a weakened army is defeated and captured, that moment is usually filled with taunts and ridicule. Paul pictures Christians taunting death when we are victorious over it: “Where is your victory now, death? Even those passages that seem to picture death as a “precious” are often misread or misunderstood. Psalm 116:15 says, “precious in the sight of the Lord is the death of His godly ones.” This passage has been quoted time and again to comfort those who have lost loved ones. And it can. But really, the way it is often used makes it hard to square with God taking no pleasure in the death of anyone who dies. It makes it hard to square with the whole rest of the psalm which is about God saving someone from death. In Psalm 116, death is the enemy to be escaped and God is praised when that happens. What this passage seems to be saying is not that death is “precious” like it’s some cherished and loved event, but that death is “precious” like a “precious stone.” Meaning an extraordinarily costly or expensive stone. It could be translated “costly in the sight of the Lord is the death of His godly ones.” Death matters to God. It is costly and expensive. That’s why he saved the psalmist from it. That’s why He is destroying death through the resurrection! Death was not part of God’s original plan and it’s not part of His eternal plan. The grand blessing of Scripture is not that we get to die. But that death is destroyed forever! Death loses and life wins. Death itself will be cast into the lake of fire with all of God’s enemies (Revelation 20:14). Death dies and goes to hell. But, strangely enough, there can still be glory in death. The glory of God. That’s what the raising of Lazarus is all about. Lazarus’ sickness was “for the glory of God, so that the Son of God may be glorified by it” (John 11:4). 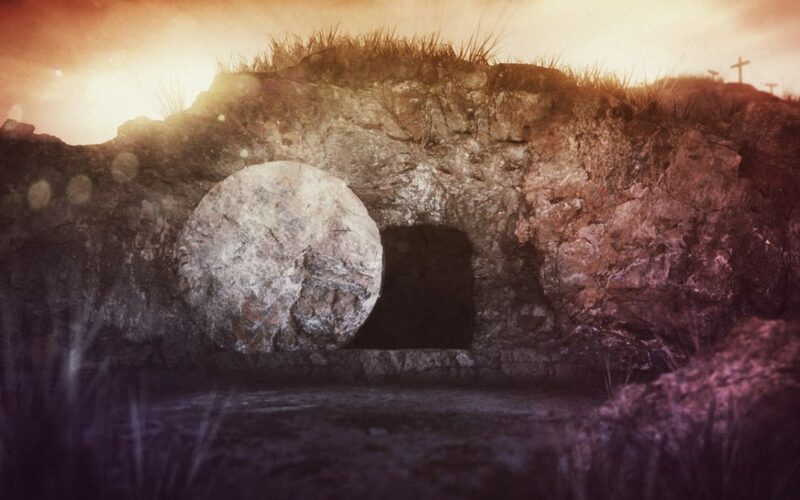 So when Jesus tells them to open the tomb and Mary protests (because her brother’s rotting dead body stinks with the aroma of death), He responds, “Did I not say to you that if you believe, you will see the glory of God?” (John 11:40). Verse 4 and verse 40 bookend the raising of Lazarus with “glory” and the sickness, death, and resurrection are all illustrating the glory of God. Interestingly, in John, the word “glory” is often associated with death. When speaking about His own death, Jesus says, “The hour has come for the Son of Man to be glorified” (John 12:23). When telling Peter about his future death by crucifixion, the text says, “Now this He said, signifying by what kind of death he would glorify God” (John 21:19). That is such a strange connection. Death is not how I usually think of “glory.” It’s a terrible invasion on God’s good creation. But there are a few ways that death does produce glory. When a martyr dies faithfully for the cause of Christ, that death produces glory. It is something to be held in glory and revered because a person has followed Christ, who through suffering and death was “crowned with glory and honor” (Hebrews 2:9). Suffering with Christ is regularly pictured as a glorious moment producing joy and blessing (Matthew 5:11-12; Acts 5:41; Philippians 1:29; 3:10; 1 Peter 4:12-16). Death is the endgame of carrying the cross. It’s the finish line. And there is glory there. But the glory that is seen in the death of Lazarus is not just that he got sick, died, and his body began to rot and stink. But what happened next. Death didn’t win. Lazarus was raised back to life, and death was seen as a failure. Death was plundered by the power of Jesus. And that was glorious. Even more glory, however, is seen in the resurrection of Jesus. Lazarus died, then came back to life. Jesus died, and rather than coming back to His old life, He pushed all the way through death to the eternal glory of life on the other side. He experienced all that death could accomplish, and walked away more powerful than ever. Never to die again. Always carrying around that victory. Death is not the end. Death does not win. But that doesn’t mean that it won’t hurt. It doesn’t mean we should just accept death as natural or somehow “God’s will.” Death is an affront to the will of God. It is the destination where sin has led us. It is a theft of God-given life and it steals our friends, family, and ultimately each one of us. It lingers over every relationship because we know it will not last. This is why “Jesus wept” (John 11:35). And others saw the depth of His love in that moment. But through this despair and sorrow, Jesus produced glory (John 11:40). Death ends in glory and while for now “you will grieve, but your grief will be turned into joy.” Have faith. Have hope. Never give up. The victory is coming. “In Him was life, and the life was the Light of men” (John 1:4). Those words are significant. They change everything. We just saw in the healing of the blind man what it means that Jesus is the Light. Now, with Lazarus lying dead in a tomb, surrounded by loved ones, the emotional Jesus will show what it means that He is life. John 1:4 is supported and explained by two of Jesus’ foundational “I Am” statements: “I Am the Light of the world” (John 9:5) and Jesus’ statement to Martha (Lazarus’ sister), “I Am the resurrection and the Life” (John 11:25). The healing of the blind man is the illustration of a puzzle, in which Jesus explains: “those who do not see may see, and those who see may become blind” (John 9:39). In much the same way, the raising of Lazarus illustrates the puzzle that “he who believes in Me will live even if he dies, and everyone who lives and believes in Me will never die” (John 11:25-26). With Jesus, life and death are not mutually exclusive. Life both exists in death, and life eliminates death. Remember when the disciples asked Jesus about the blind man, saying, “Who sinned, this man or his parents, that he would be born blind?” (John 9:2). Jesus’ answer is that his blindness is not the result of sin, but “that the works of God might be displayed in him.” Similarly, when Lazarus contracts a deadly illness, Jesus explains, “This sickness does not lead to death, but for the glory of God, so that the Son of Man may be glorified by it” (John 11:4). John 9 and John 11 are climactic in proving that Jesus is what the Gospel of John says He is. He is the Light and the Life. Jesus will again say, “I am the way, the truth, and the life” (John 14:6). The raising of Lazarus proves what it means that in Jesus is life. But think about that phrase for a moment. Jesus says, “This sickness does not lead to death” (John 11:4). What a remarkable thing to say for a sickness that within a few days leads to death. This sickness did lead to death. In fact, if you read carefully, you’ll see that it results in two deaths. Lazarus died from the sickness. But then this “sign” is ultimately what leads to Jesus’ death also. In John 11:8 the disciples are concerned because Jesus wants to go to Judea to see Lazarus. And what happens when Jesus goes to Judea? “Therefore they picked up stones to throw at Him…The Jews picked up stones again to stone Him” (John 8:59; 10:31). His disciples say, “Rabbi, the Jews were just now seeking to stone You, and are You going there again?” (John 11:8). Judea is getting pretty dangerous for Jesus. In fact, after raising Lazarus, the chief priests meet together and decide that Jesus has to die, “So from that day on they planned to kill Him” (John 11:53). Right after that decision, we are told “Now the Passover of the Jews was near” (John 11:55). This is the final Passover in which the Lamb of God will be killed to take away the sins of the world. Passover and Judea have developed a foreboding presence in the narrative. When Lazarus got sick, he died. This led Jesus back to hostile Judea. Where He would die. Jesus was willing to sacrifice His own life for His friend, Lazarus. Sacrificing His life for His friend? Sounds familiar. “Greater love has no one than this, that one lay down his life for his friends” (John 15:13). Lazarus’ sickness did lead to his death, and indirectly to the death of Jesus. So why does Jesus say, “This sickness does not lead to death”? Because with Jesus, death leads to life. Death never has the final say. The final result of the sickness is not death, but something glorious. The glory of God will be seen (John 11:4, 40). Jesus will prove emphatically that He is the resurrection and the life. He will prove the statement “in Him is life” (John 1:4). Jesus will do this, yes, by raising Lazarus. But that resurrection is a sign. It is pointing to something else. Jesus will not only raise Lazarus, but in a few days, He will be resurrected as well. The raising of Lazarus is a climactic sign that points to the singular moment that changed all human history: the resurrection of Jesus. When Lazarus is raised, he comes hopping out of the tomb still wrapped in his burial clothes. This may symbolize that while Lazarus was raised, he was not raised to immortality. He is still wrapped in death. Death is still in his future. Death is still in his nature. But when Jesus is raised, the wrappings were off, they were lying on the grounded with his face-cloth rolled up by itself (John 20:5-7). Death was removed, cast off, and laid aside forever more. This moment not only shows that Jesus holds the power of life for Lazarus and Himself, but it also vindicates the claims made in John 5:28-29: “an hour is coming, in which all who are in the tombs, will hear His voice, and will come forth; those who did the good deeds to a resurrection of life, those who committed the evil deeds to a resurrection of judgment.” This is the moment that Martha spoke of. After Lazarus died, Jesus told her, “your brother will rise again” (John 11:23). She heard this as a generic word of comfort that someday, there will be a resurrection at the end of time. A nice thought, but not overly comforting when she misses her brother right now. She says, perhaps despairingly, “I know that he will rise again in the resurrection on the last day” (John 11:23). While that’s not exactly what Jesus meant, she’s not wrong. Jesus will raise Lazarus from the tomb, He will be raised Himself, and then all who are in the tombs, all who have ever died will be raised to life again. In Jesus is life. And this is what it looks like. Sorrow turned to joy. Death loses and Jesus wins. Life wins. Life is eternal. Life wins both spiritually and physically. Death cannot destroy spiritual life and physical life will destroy death. Through Jesus, life is more powerful than death. “These things have been written so that you may believe that Jesus is the Christ, the Son of God; and that believing you may have life in His name” (John 20:31). Paul can be pretty feisty when dealing with heretics. Honestly, Paul seems like a pretty feisty guy in general. But last night a thought occurred to me. Paul’s feisty personality can be an interesting example of the transformative power of Jesus. Here’s what I mean: Paul dealt with heretics a lot throughout his life, but somewhere in there a major shift took place. Paul dealt with heretics before he met Jesus and after he met Jesus. With Jesus comes a significant change in his thinking and actions toward those who pervert the faith. Prior to Jesus, Paul describes himself as “a persecutor of the church” (Philippians 3:6). His zeal led him to the conclusion that those who “apostatized” and worshiped Jesus were dishonoring God, blaspheming, and needed to be violently pursued. A “zealot” was one whose religious convictions leads to violence and murder. They would kill for the faith. To be zealous often had violent consequences, and there is a long tradition of this in Judaism (see Phinehas who “was zealous for His God,” Numbers 25:6-13). “When Mattathias saw it, he burned with zeal and his heart was stirred. He gave vent to righteous anger; he ran and killed him upon the altar. At the same time he killed the king’s officer who was forcing them to sacrifice, and he tore down the altar. Thus he burned with zeal for the law, as Phinehas did against Zimri the son of Salu. Then Mattathias cried out in the city with a loud voice, ‘Let every one who is zealous for the law and supports the covenant come with me!’” (1 Maccabees 2:24-27). Paul is one who would have followed Mattathias. He would have been right with Phinehas. Paul saw Christianity as a perversion that needed to be snuffed out. He would be blessed as a righteous hero, a zealous devotee of Yahweh. This is what Paul means when he writes, “as to zeal, a persecutor of the church” (Philippians 3:6). That’s why he was “breathing threats and murder against the disciples of the Lord” (Acts 9:1) and why he says, “being zealous for God…I persecuted this Way to the death , binding and putting both men and women in prison” (Acts 22:3-4). Paul laments, “I used to persecute the church of God beyond measure and tried to destroy it…being more extremely zealous for my ancestral traditions” (Galatians 1:13-14). Paul loved God. This is one way he showed it. But that all changed one fateful day. Paul’s zeal would be transformed. His whole life would be transformed by an encounter with the risen Lord. Jesus changed everything. We know the story. Paul had this experience with Jesus, he became a believer, and he took the faith to places no one had imagined. But he still had to deal with those blasted heretics. Previously, he viewed “the Way” as a heretical movement. Now, in many ways, things are reversed. The persecutor has become the persecuted. Those who are dishonoring God are those who reject His Messiah. They are now the “blasphemers.” Paul now deals with idolatrous pagans who reject Yahweh, Jews in the synagogues who reject the Messiah, and false teachers within Christianity itself. Paul has to fight false teachers who sneak in and try to undermine his ministry. They try to distort his gospel. Paul is under constant attack, verbally and physically. Paul now deals with those who want to persecute him. The transformative power of Jesus is seen in how Paul now responds to the “heretics.” Does his zeal lead him to violence and persecution? Does he tell his churches to arm themselves against their persecutors? Does he try to force conversions? Like Phinehas does he grab a spear? Like Mattathias does he prepare for battle? Not at all. Paul is just as zealous as ever. Even more so. But his zeal has been transformed. He’s zealous enough to die rather than kill. After Jesus, he chooses to receive persecution rather than inflict it. After Jesus, he tries to save his enemies rather than harm them. To Paul, love has become a more powerful motivator than fear and death. He makes himself a slave to all (1 Corinthians 9:19). He encourages his churches to “Bless those who persecute you, bless and do not curse…Never pay back evil for evil to anyone…Never take your own revenge, beloved, but leave room for the wrath of God…Do not be overcome by evil, but overcome evil with good” (Romans 12:14-21). Paul is starting to sound a lot like Jesus. Now, don’t get me wrong. Paul is still a feisty guy. Read Galatians. He may call a curse upon those who change his gospel and harm his churches (Galatians 1:8-9). He may even make a few jaw dropping statements (read Galatians 5:12, yikes!). One of the oddest moments in his ministry was when God momentarily struck one of his opponents blind in a showdown of supernatural power (Acts 13:6-12). But his overall approach has been drastically transformed. Instead of violence, he calls for repentance. When it’s time for discipline, he calls for correction, or rebuke, or tragically even expulsion from the community (for the purpose of restoration to the community). But never persecution. Never violence. Never death. Jesus changes things. Jesus changes people. He does so in many ways. This is just one way (of many) that Paul seems to have been transformed by Jesus. He’s the same guy. He still deals with heretics. But he seems to love at an impossibly new level. It is one thing to care so much that you’ll kill for your faith. It is something else entirely when you care so much you will sacrificially die for it. I hope Jesus makes that kind of change in every one of us.